In case you were wondering, my love affair with Marie Veronique Organics skincare is still going strong. While using the MVO Anti Aging Oil (which recently got its name changed to MVO Face Oil) the appearance of my skin has drastically improved. It went from congested, oily, and easily irritated to smooth, plump, and clear from blemishes. I have tried other great treatments that helped, but the MVO Face Oil balanced, smoothed, and healed my skin. 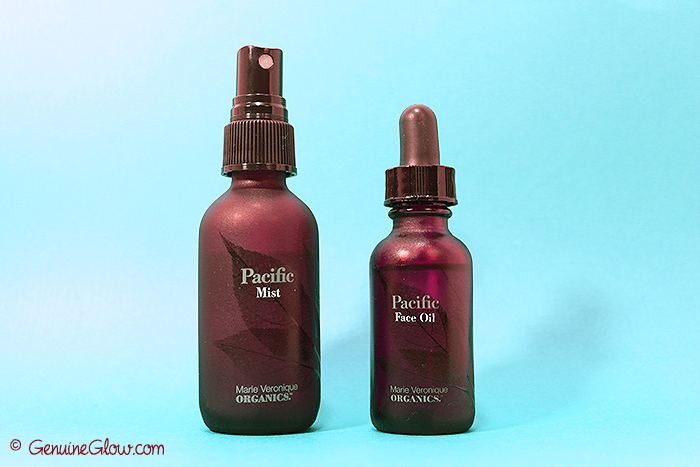 With that being said, I still wanted to try the Pacific line from MVO because it is 100% vegan, and I knew many of you would have been interested in it. 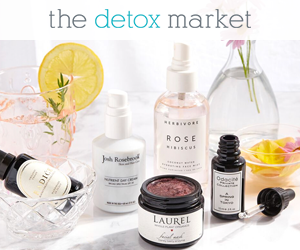 I have been using both the Pacific Mist* and the Pacific Face Oil*, and I have been applying them in the same way that I did with the Anti-Aging Mist and Oil: cleanse, spray my entire face with the mist and then massage it with the oil. This simple routine, done every evening for a few weeks, has kept my skin well balanced and extremely supple. Pacific Mist, is a lovely hydrating mist. The main active ingredients are: green tea and white tea extracts (for antioxidants and polyphenols); sea kelp extract (rich in vitamins and other nutrients); and sea fennel extract (for deep hydration). The scent is refreshing, a little floral, (very similar to the MVO Face Mist), and it is an amazing hydration booster that prepares my skin for the oil (it is always best to apply facial oil on damp skin). Astaxanthin – the most powerful source of antioxidants. It is used for its anti-aging benefits and to reduce signs of UV-aging. Chia Seed and Kiwi Seed Oil – they provide nourishing fatty acids to the skin that help it to stay hydrated and protected from environmental damage. The verdict: Love these two products, just as much as the MVO Mist and Face Oil because they do all the same great things for my skin. The only difference that I have noticed between them is that the MVO Face Oil is more powerful at healing my blemishes than the Pacific Face Oil. When I use the MVO face oil at night before going to bed my blemishes are almost or completely gone by the time I wake up (not exaggerating here!). However the Pacific Mist + Oil has kept my skin visibly hydrated, plump, radiant and healthy-looking.